FHBP initiated and facilitated the OCRP concept and project and its ultimate formation into its own 501(c)(3) organization. An FHBP Board member serves on the OCRP Board. 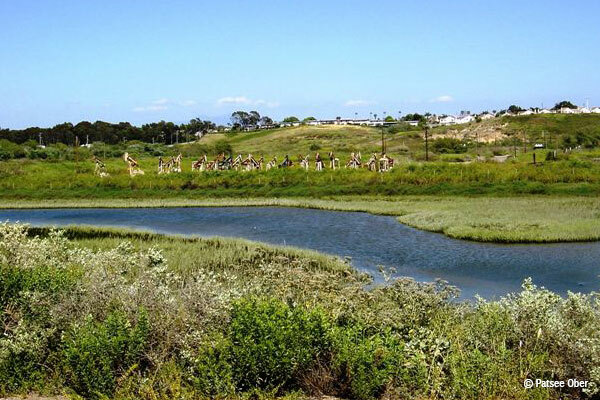 FHBP has helped to provide funding through the OCTA Measure M2 Environmental Mitigation Program for restoration of wetlands in Fairview Park in Costa Mesa, part of OCRP. FHBP’s Green Vision Map shows the Orange Coast River Park in its entirety, including the still privately owned Banning Ranch, in red meaning that the desired conservation open space is threatened by development and should be saved. FHBP supports, writes letters, and testifies to help the Banning Ranch Conservancy’s efforts to save Banning Ranch. The OCRP project was initiated in 1998 by FHBP. A Concept Plan was developed by a partnership facilitated by FHBP. The partnership included: the cities of Costa Mesa, Huntington Beach, and Newport Beach; the County of Orange; and the California Coastal Conservancy. The Concept Plan was completed in 2002. From 2002 – 20011, FHBP facilitated monthly networking meetings for the partnership in order to work together to implement the plan and fund projects. In 2011, a stand alone non-profit was incorporated, the OCRP, Inc.
FHBP has supported the Banning Ranch Conservancy which seeks to save all of the 410 acres of Banning Ranch and include it in the OCRP. In September 2016, the Coastal Conservancy denied the Banning Ranch LLC proposal and a new proposal is expected in 2017.